The floral industry isn’t exactly blooming these days. According to the Society of American Florists, there were 25,617 floral shops in America in 1998. By 2009, that number dropped to 17,493, a difference of 8,493. It is estimated another 4,000 floral shops will close nationwide in the next two years. We’re told 3 floral shops have gone out of business in Roanoke in the past year. Floral shops say the downturn in the economy, increased competition from the internet, and big box chains are the reasons for so many closures. Stores like Walmart and Kroger can sell flowers at cheaper prices because they buy so much volume. 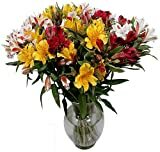 Peruvian Lilies are our favorite flowers that stand the test of time. Whether you choose the single or double sized bouquet, you will have a big display of long lasting flowers. We guarantee ours will stay fresh at least 12 days! They are absolutely beautiful and our Lily bouquets consist of at least two different colors of lilies. A great flower value. All inclusive pricing.